B and I have been traveling for the holidays. With travel comes people. People I meet or people I see again for the first time in a while. And when these people meet or hear of Braeden, they are curious. One of the questions I've been getting a lot lately goes something like this: Is he really stubborn? How does he behave for you? Sure, there is some stereotype or just plain fact behind that question, but my answer always sets them at ease. 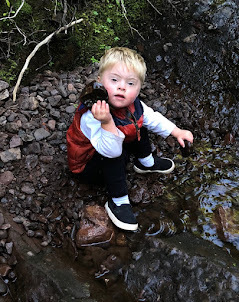 Now I want to say that, although Braeden is "different," the way I teach him how to cope with his emotions is not unique for children with Down syndrome or special needs. It can be used for any child -- or any adult, for that matter. And it is so simple. It's a basic part of life. So when Brady P. works himself into a tizzy, from not getting to hear the stomping song every single time he asks or not being able to eat pizza for breakfast or whatever is prevalent at the moment, I know I have to calm him down, or he will just turn into a mess. "Take a deep breath," I tell him as I dramatically inhale and exhale until he does too. After he takes a deep breath, he is able to listen to my words and think clearly. Then I can ask him, "What would you like, Braeden?" He stomps his foot for the stomping song (or signs for whatever desire that cannot be fulfilled at that time). "Braeden. We can't listen to the stomping song right now. Would you like to play a puzzle with me?" He hits himself on the side of the head to tell me yes. "Okay! Let's go play a puzzle!" We are both happy. The crisis is averted. Do you see what happened there? By forcing some fresh oxygen into his lungs, and exhaling the stress, he was able to relax. His mind could think clearly. It's a quick and easy transitional method. Then, I redirected his energy from something that we couldn't do to something that we could do. Deep breath. Relax. Transition. Redirect. Ahhh. It works nearly every time. Braeden is a really good kid. He's at the point where I can take him places, and as long as he's not missing his nap, he is well behaved. He understands his emotions because we talk about them as they arise. He knows how to calm himself down with a little reminder from Mama. He loves to sign his manners. He is amazing. And I am so grateful for this opportunity to get to learn with him. To watch him grow into a wonderful little man. And to know that I am doing my best to raise my extraordinary son in a way that he will be able to help change the world. Great advice for us all Amanda... you’re a wonderful mother.